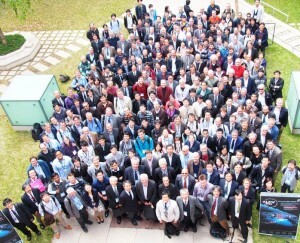 At the ILC Tokyo Symposium, held on 22 April 2015 at the Ito International Hall, Tokyo, Japan, the Linear Collider Collaboration (LCC) and the more than 300 participants from around the world at the Asian Linear Collider Workshop (ALCW) 2015 decided to issue a statement confirming their conviction of the scientific justification for a prompt realisation of the International Linear Collider (ILC). The ILC’s role in particle physics is to explore with exquisite detail the fundamental forces and constituents of matter by recreating the conditions just after the beginning of the Universe,. This research is unique and indispensable for a deep understanding of how our Universe began, how it evolved, and how it works today. We are eager to build and work at the facility. The technical feasibility of the ILC has been demonstrated in the Technical Design Report, The ILC is ready to be built following the completion of an engineering-design phase. The project is now in a phase where governmental involvement should lead to a decision to realise the project. In this context we express our appreciation of the ongoing project assessment being undertaken by the Japanese government. The ILC is one of the largest scientific projects ever proposed, on a similar scale to the Large Hadron Collider project. Its realisation as an international project requires the establishment of an international framework for sharing the cost and expertise among countries. We therefore intend to facilitate discussions between governments and funding authorities to achieve this goal as soon as possible.